We had been without power for 15 hours when we left for Tristan’s and David’s to charge devices and get on the Internet. About 7:00 pm last night very high winds and pouring rain that took out the power. Puck was out during most of the storm and finally came in soaking wet about 8:30, bringing a good amount of the 2 inches of rain we got with him. He reluctantly posed for photos illuminated by our flashlights, but finally gave me a nice “Chat Noir” pose. 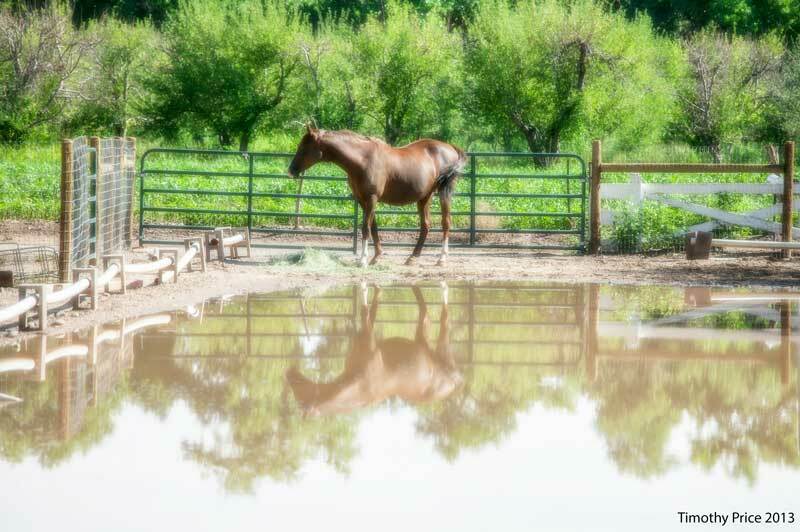 The neighbor’s corrals and arena were still flooded this morning, and the horses were fed on the high spots along the edges. 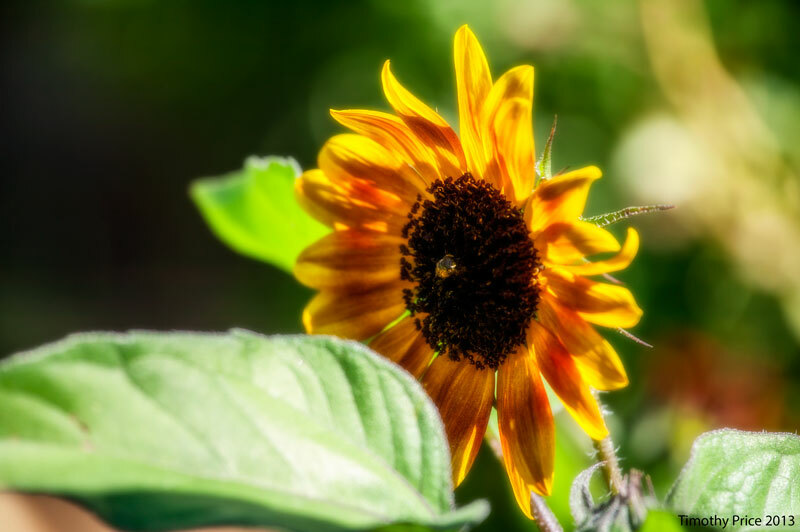 The morning sun was brilliant in the fresh air, and the sunflowers and bees were happy after the rains. 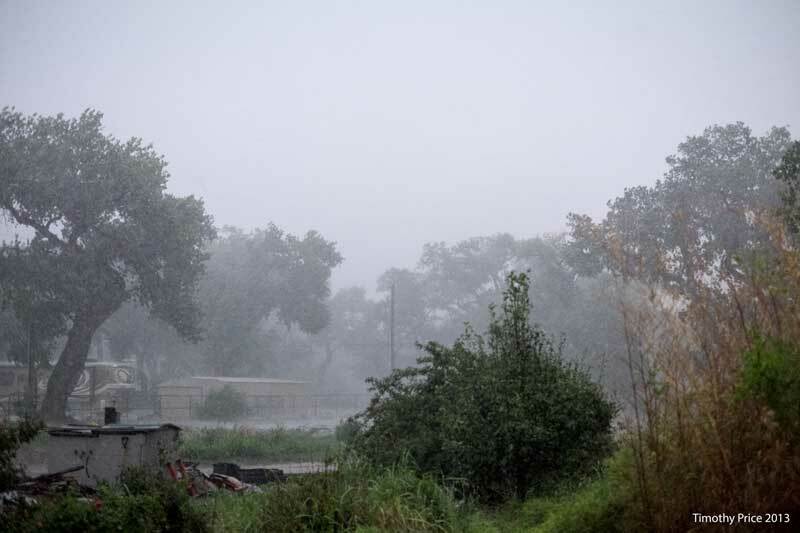 Wow, what a storm and what a mess! Glad everybody is safe, though. Hope you get power back soon! Our weather station shows we have now received 4.93 inches of rain for the year. 4 inches of the total in the last two weeks. What a coincidence! We got a storm this morning and Mr Bowie was outside. I got similar pictures of him soaking wet. I’ll post the pictures tomorrow. I’m looking forward to seeing those photos. Did your power stay on? No problem with the power but there was severe damage in the neighbourhood; a house caught fire by a lightning strike and a lot of trees were uprooted or broken. We just got power back about an hour ago — 21 hours without power. Besides a few leaks from the driving rain, only one branch came off a tree, and we weren’t hit by lightning, but it was really close at times. Thank goodness the electric is back on and everyone survived. Great shots of the storm and your Puck looks like our Ali. What a storm! I’m glad you and your family are okay. 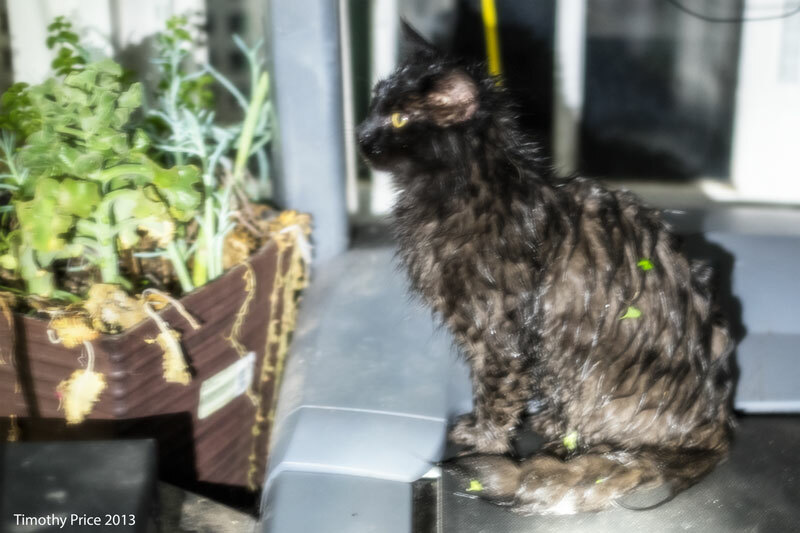 What a cute photo of Puck – he is so adorable wet! 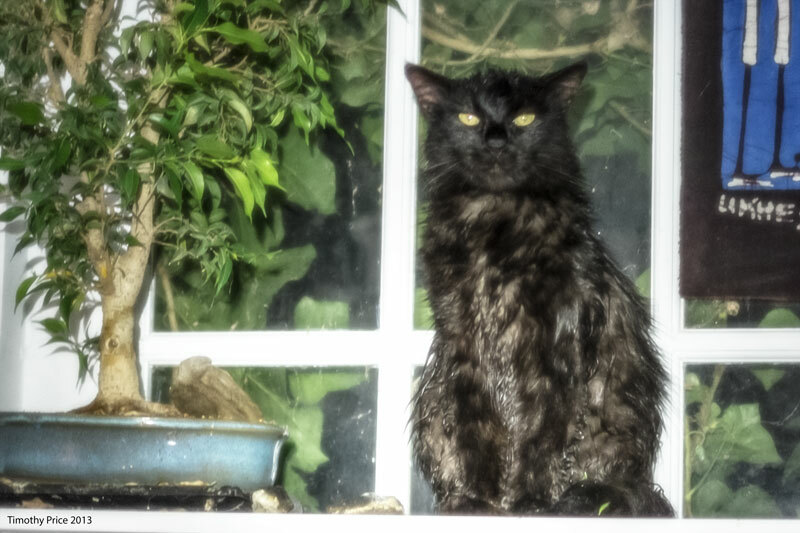 A wet cat is really…wet. That was Puck. He was our third, black Shakespeare cat. He disappeared about a month after these photos were taken. He was a stray cat that we took in, and he was always a bit on the wild side. We’re still sad and miss him greatly. I guess he had a great personality. I used to have cats as a child, but they always got killed by cars. One black and white cat called Måns I really loved. He disaoppeared on my first day in school after the summer vacation. the worst thing is not knowing what happened to them.